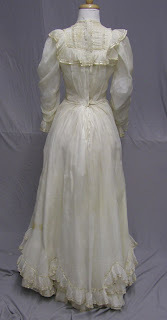 1900 Fine Cream Cotton Teagown Museum De-accession Edwardian:This Edwardian tea gown was made just after the turn of the 1900's. It is made of a fine cream cotton and is trimmed in silk satin ribbon. 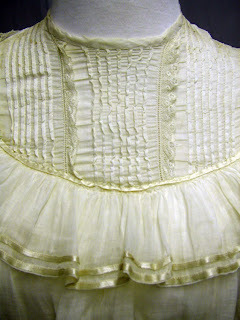 The skirt has a built in petticoat with two tiers of under ruffles which are each trimmed with two rows of silk ribbon. 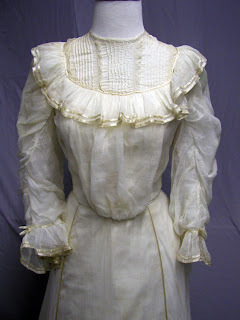 The over skirt is of fine lawn which has swag ruffles that are also trimmed in silk ribbon. The waist of the skirt is 27 and the length is 38. 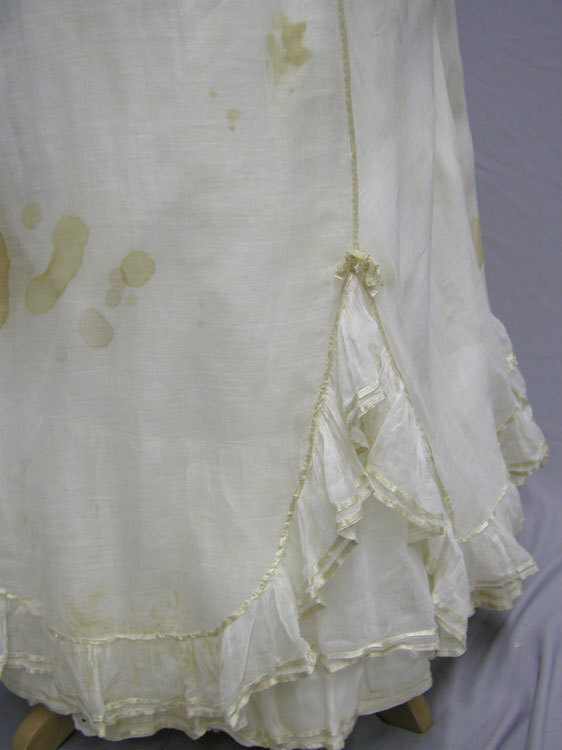 The skirt has a few pin holes and some very large and dark stains. See photos. 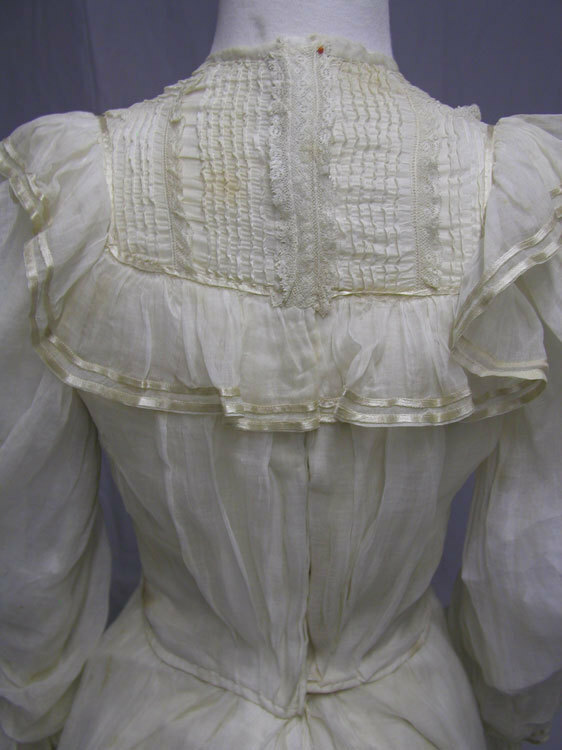 The bodice has a bust of 32 and a waist of 26. 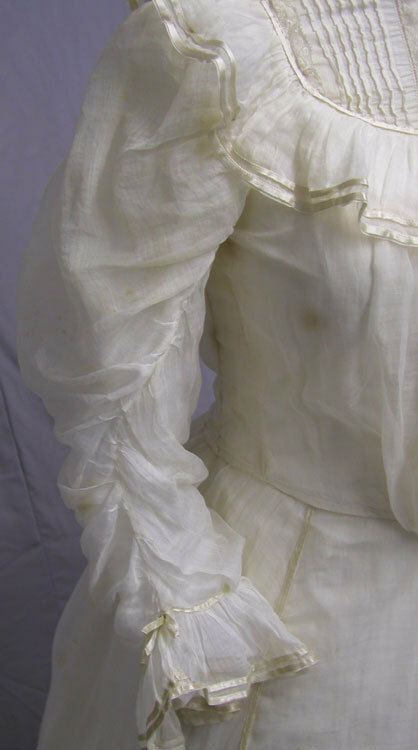 There are stains on the bodice including some underarm darkening. There is one wear hole about 1/2 inch square on the back. The cotton is still soft and pliable, but the darkness of the spots make it a little harder to clean. This has the gathered bodice that was made in a pigeon style. The 2 pc. dress is from the Gibson Girl period. 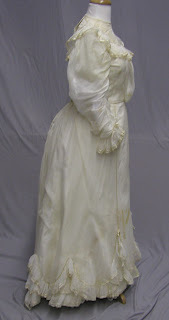 This garment was part of a museum de-accession auction that I attended this last year. The bidding will start at .99 with no reserve. I wish isn't posted with a bustle -since that wasn't really in use at that point. However, this looks like all it needs is some oxyclean and it would be near perfect.